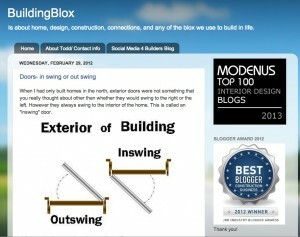 Todd Vendituoli‘s Thebuildingblox.com is truly well designed. Some current and recent postings reflect his invitation to Cologne, Germany on a sponsored all-expenses paid blogger’s tour (I wish I could get that kind of perk from blogging) and so he is paying back the tour sponsors with some positive publicity and recognition. 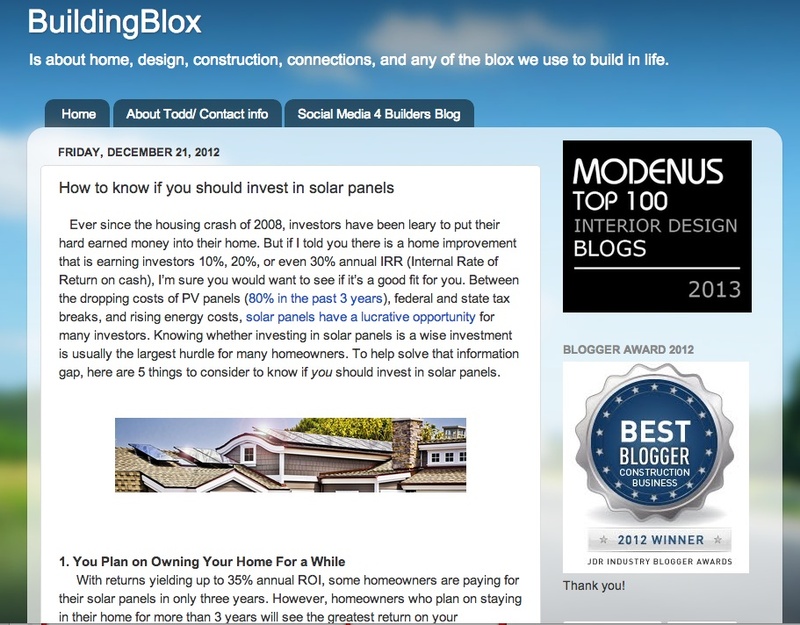 However, if you dig a bit deeper, you’ll discover some other fascinating and well-written content, especially in his “Social media 4 builders blog” tab. Here’s one of his postings there. If you look around you’ll see that the world has changed. Almost every aspect is now different. So as it alway happens, change has to occur. It will be fought by the old guard and the one’s that move forward will be the successors. When I look around I see people wanting more and more to be connected to communities with other like minded people. These communities are formed with common beliefs and values that they hold to be true. They no longer look at products as just items to be bought and used. These purchases are thought out as the next generation doesn’t just needlessly buy things for the sake of buying something. It has to have a use for them and they want to be part of something. They want to feel they are part of something that they relate to. This is a strong emotion and lets face it, buying any item has always had an emotional value. Now that has grown even more. It has to be useful, needed and they want to be part of the group that also shares their thinking. It’s not that hard to understand is it? As the world expands so rapidly people, being social creatures at heart, want to feel a connection to others and that has moved into the business realm too. We live in a fast paced world. This is an aspect of social media that will continue to grow and evolve. Companies will need to create communities of like minded thinkers and as they do they will sell their products. This, of course, assumes they have good products to sell and can build their communities wisely and honestly. It’s more about creating a culture around your business and products. Create a culture and community around your business and it will grow. You will sell products. You will retain and grow your customer base. However this doesn’t happen overnight and in fact takes a great deal of time and expense to do but if the longevity of your business is a thought for you, I would advise you to start thinking in these terms. Todd really knows his stuff and you’ll especially enjoy the care and attention to detail and design here. He has been a builder for many years. owning Todd Vendituoli Construction L.L.C. based out of West Burke, VT and owner of KV Construction Company Ltd based out of Eleuthera, Bahamas. Best Construction Blog nominations are open until January 31, 2013. You can nominate your own blog or any you like. Voting for the finalist bloggers commences Feb. 1. There is no cost to enter the competition.